Everyone wants a GoPro. Some people have just been better at holding out on dropping $400 on the premier wearable action cam. Now with the launch of the GoPro Hero4 Session, resistance is futile. It will still cost you, with both standard and surf Session cams priced alongside its the Hero 4 Silver model - that's still lower than the flagship Hero4 Black at $399. But it's also 50% smaller, 40% lighter than the Black edition and it's now waterproof to 10m without the need for housing. In short, GoPro has taken all the best bits of its rivals from Garmin, Panasonic, TomTom and Polaroid, and used them to build one killer action cam. The Hero4 Session has a one button control to start shooting video or taking Timelapse photos depending on how it has been set up. It has built-in Wi-Fi and Bluetooth, of course, so it connects to GoPro apps on smartphones and tablets. And it shoots 1080p video at 60fps, 1440p video at 30fps and 8MP stills. With the sleek but rugged build, compact 1.5-inch cubed size and features like auto low light, dual mics and auto image rotation if the camera is mounted upside down, it seems GoPro has made an action camera for everyone. Battery life is max two hours, which is to be expected, and will be less with Wi-Fi and Bluetooth on. The Hero4 Session is compatible with all GoPro mounts but we've also got a few exciting additions including the Strap accessory for mounting to hands, wrists, legs and arms. 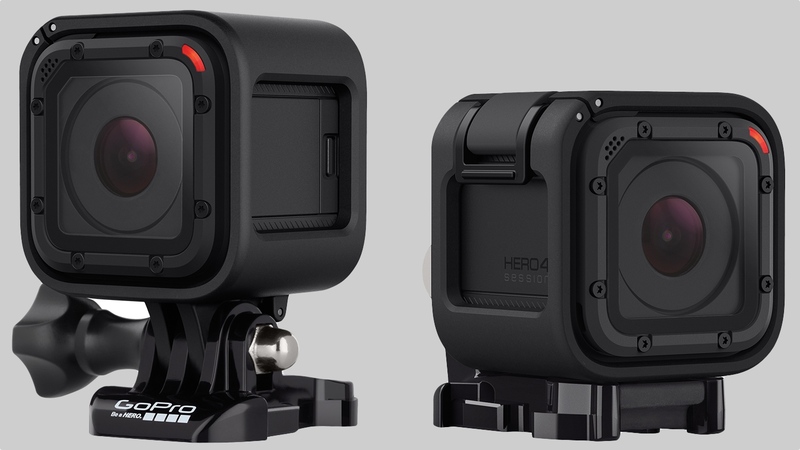 The Hero4 Session will go on sale on 12 July, just about in time for summer hijinks. Sign up at GoPro to be notified when it's available. And stay tuned for a review coming very soon on Wareable.